This weekend started off with a rather boring Friday night in. Mr. Prevention worked late and I ended up eating leftovers and reading. It was actually rather perfect, especially as I had a special date night planned for Saturday. ANYWAY. We showed up to the brand new casino to find out that even though it had only been open for 2 weeks it already reeked of cigarettes and they also had ZERO tables. It was all slots. LAME. Unfortunately, I wasn’t able to get in a workout before dinner (which certainly would’ve freed up a few extra calories to enjoy…). Mr. Prevention and I have both been plagued with injuries and to add to this list, I do believe I have a stress fracture. It hurts to walk much less run and so rather than babying it on the bike at the gym or even considering swimming (HATE! ), I’ve settled on whining about it while applying ice and elevating. Hoping for a speedy recovery because I have been loving my morning runs. 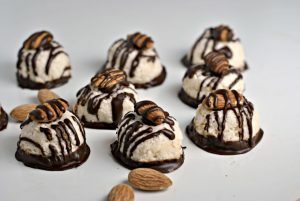 So today, when I would normally have worked out, Shea and I made these “Healthy” Almond Joy Truffles. 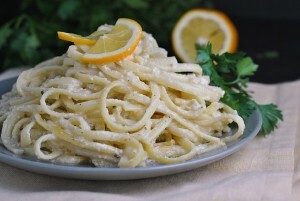 They immediately caught my eye while meal planning for this week and I just so happened to have all the ingredients on hand. If you’re an Almond Joy lover, you will adore these. Less sinful than the real deal, but just as tasty and certainly cuter. I will warn, however – these are addicting! To make the truffles, pulse the coconut, coconut oil, and maple syrup together in a food processor until well-combined. Be sure to leave some texture to the coconut. Using a 1 tablespoon scoop, form the truffles and place onto prepared baking sheet. The bottom side should be flat. 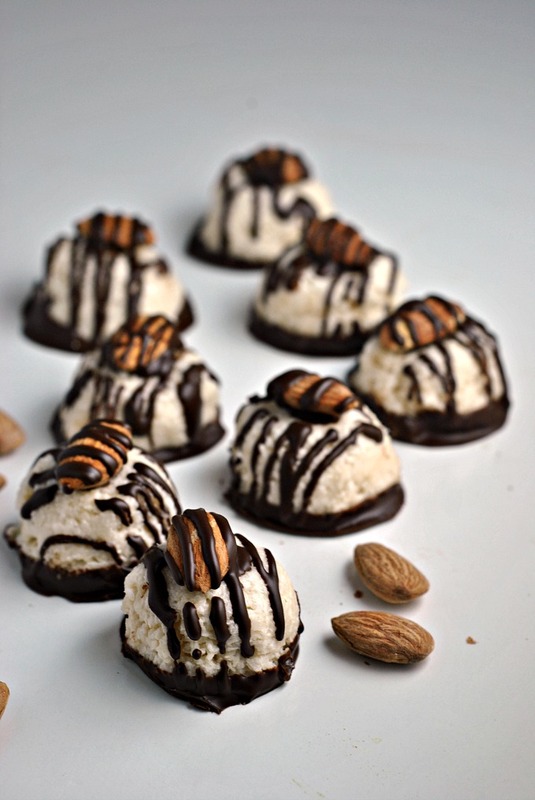 Use a finger to gently flatten the top of the truffle to fit with the almond in a later step. Repeat with remaining coconut mixture and freeze for 10-15 minutes. In a microwave safe bowl, combine the chocolate chips and ½ tablespoon coconut oil. Microwave for 45 seconds on high; stir. Repeat microwaving in 15-20 second increments, stirring each time, until the chocolate is smooth. Working one at a time, dip the bottom of each truffle in the chocolate and return to the baking sheet. 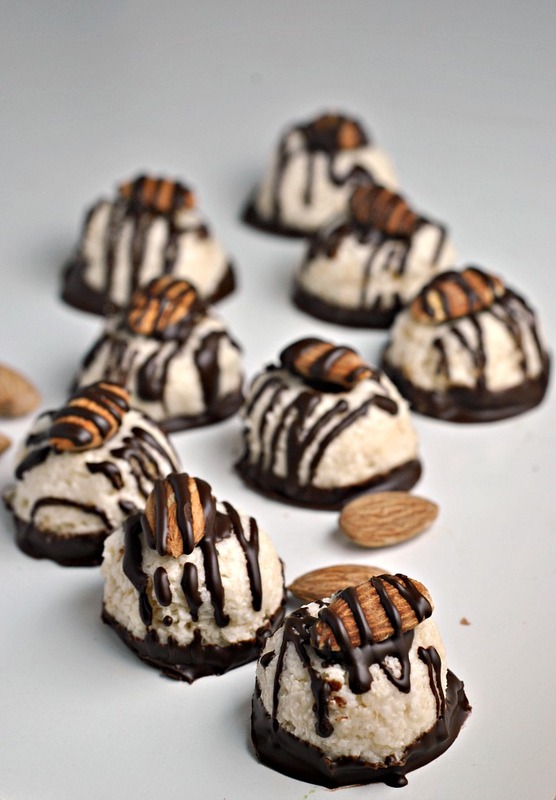 With remaining chocolate, place a small drop on top of each truffle and top with the almond. 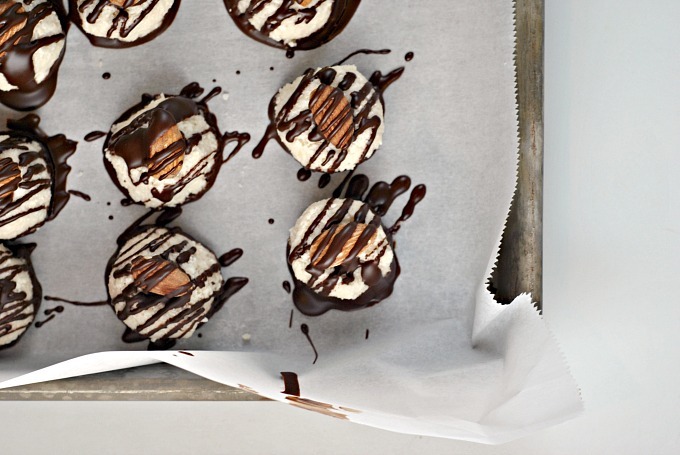 Use a spoon to drizzle the chocolate over each truffle. Return truffles to freezer for 15-20 minutes or until set. Thaw for 5-10 minutes before serving. I loved that adorable pic of Shea helping you make them, in her pretty pink dress! These look AMAZING. I am usually not an almond joy fan because sweetened coconut is not my favorite, but I love treats that start with unsweetened coconut. Looks like a winner of a recipe Nicole! I ran out of the chocolate/coconut oil mixture before I was finished dipping! Next time I will probably double it to make sure I have enough. Oh no! 🙁 Maybe add a bit more coconut oil to thin it out more? These are really different to any desserts I’ve seen before – I don’t think we get Almond Joy in the UK?! Keen to give them a try 🙂 thanks!